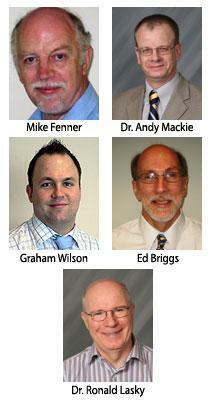 Indium Corporation announces the company's Silver Quill Award winners for 2010. Mike Fenner, Technical Projects Manager, European Operations, Dr. Andy Mackie, Global Product Manager, Semiconductor and Advanced Assembly Materials, and Graham Wilson, Applications Engineer, authored the award winning paper, "New Developments in High Performance Solder Products for Power Die Assemblies". This paper was written for and presented at IMAPS 2010 in Raleigh, North Carolina. Ed Briggs, Technical Support Engineer and Dr. Ronald Lasky, Senior Technologist, were presented with the Silver Quill's Impact on the Industry award. Their paper, "Process Optimization to Prevent the Graping Effect", was written for and presented at SMTA's International Conference on Soldering and Reliability, in Toronto, Canada. Copies of the papers are available for download on Indium Corporation's website. Indium's Silver Quill Award was developed to encourage individuals to author technical reports, presentations, articles, and books and to honor the most effective works. Points are awarded for the quality and quantity of the work and for the region and market the work addresses.